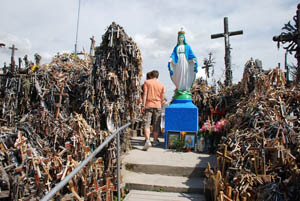 We crossed over into Lithuania as easily as any other EU border and headed for the "Hill of Crosses"
This is a small knoll where people have put up crosses for a several hundred years. During the Soviet occupation time (1944-1991) it was bulldozed a couple of times (officially no religion was allowed for Soviets [regardless of how they venerated Lenin]). But the crosses would re-appear immediately. Nothing could stop the people from putting up the crosses. 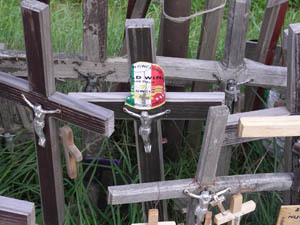 Today the small crosses from the souvenir shop dominate the top but there are handmade wood, steel, and stone crosses that go outward from there. We were not the first GoldWingers there. 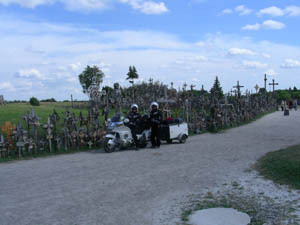 One of the crosses was for a member of the GoldWing Club of Italy. The total number of crosses, each dedicated to an individual, has to be well over a million now. We made it to Vilnius, the capital of Lithuania without mishap and set up camp in the city campground. Again it is a makeshift camp in a city Expo grounds, the RV's are in the parking lot and tenters have their choice of grassy areas between the buildings. The toilets/showers are in huge cargo boxes converted to toilets/showers. The three Baltic countries have each had a capital with its own personality. 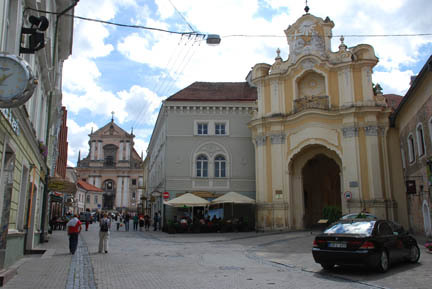 Here in Vilnius it is churches, our guide book lists 22 of various faiths. This picture has two of them in it. 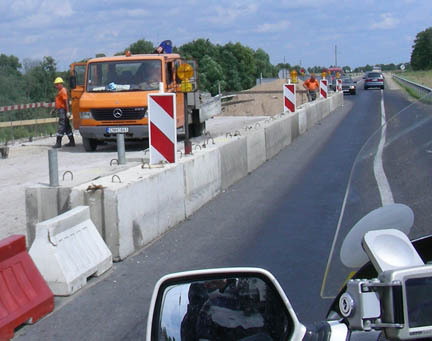 The three Baltic countries of Estonia, Latvia and Lithuania could be dropped into the two US states of Washington and Oregon (we live on the border between the two) and be lost. Although closer than the very similar primary cities of Seattle (Washington) and Portland (Oregon) the primary cities of Tallinn (Estonia), Riga (Latvia) and Vilnius (Lithuania) are very different. Tallinn is a party city, Riga has beautiful Art Deco buildings and Vilnius has its churches. The next day we took the bike and went to some outlying places, the center of Europe, a sculpture park and a castle. 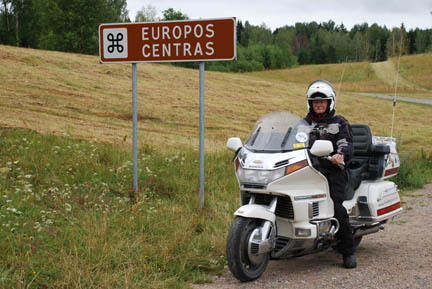 The first stop was at Europos Centras, the center of Europe as determined by a French group of cartographers in 1989. It is about 25 km. (16 miles) north of Vilnius. There is a monument there and a set of flagpoles with all the countries flags on them, but one could not drive to there, we had to walk to it so this is the picture you get. Then southeast about 25 km. to the Europas Centras Sculpture Park, no connection, except name, to the site above. 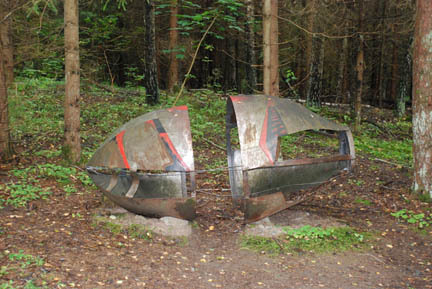 It is an open-air museum that covers over 150 acres with trails through the woods to various sculptures. This was a huge disappointment, it was developed about 20 years ago and is getting very overgrown with brush and encroaching trees. And then the "art" left a lot to be desired, this is "Birth of Wine" by Irakli Tsuladze, a Georgian, done in 2002. And it was expensive too, they charged us for entry, the right to take pictures and parking totaling about 25 US dollars. We felt ripped off! Then we went 25 km. 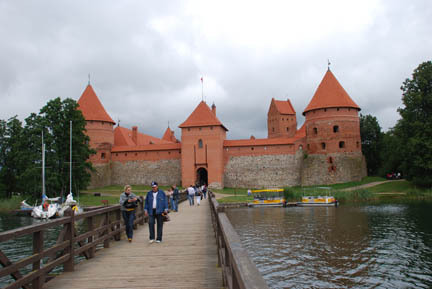 west of Vilnius to Trakai Castle. This rebuilt 14th century castle was very interesting to tour and cost less than the park above. It sits on an island in a lake and was in ruins until the 20th century when it was rebuilt in the original pattern and style. In this way it is similar to the Almodóvar castle in Spain that we visited a year and a half ago. 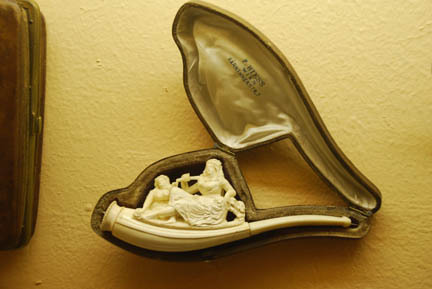 This castle had very good and interesting displays of armor, porcelain, beaded purses and pipes, smoking pipes from the 17th to 20th centuries, in ivory, porcelain and metal. The displays were well done and had descriptions in English as well as Lithuanian and German. After three days we left Vilnius and headed for Poland, but on the way we stopped at Gruto Parkas. This is another open-air museum but of a different sort. 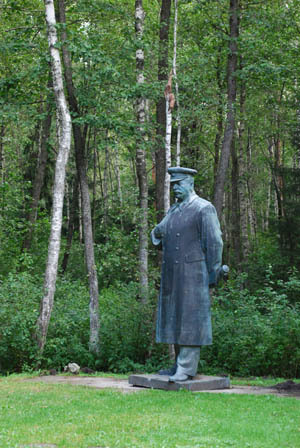 A rich local man noticed that the many statues, plaques, and other things of Soviet times were being destroyed and lost. He felt that this time of their history should not be ignored and lost, but remembered and learned from. 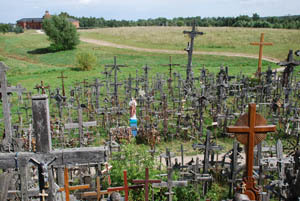 He used a part of his property in the very southeastern corner of Lithuania to display them. 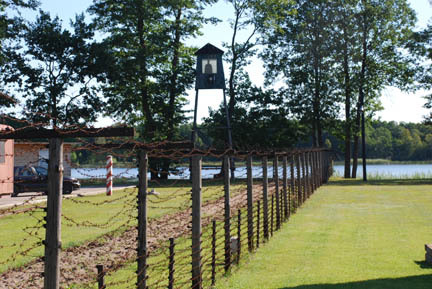 He has designed the park as a Soviet prison camp. All of the captions are in English, German and Latvian. Inside are buildings, statues and plaques he has salvaged, using his own money, and put them on display. 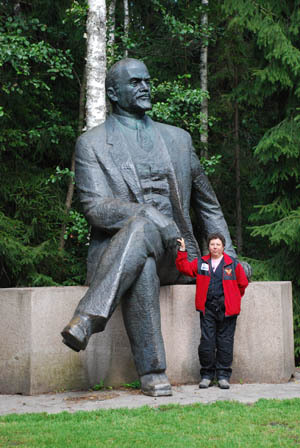 Here are larger-than-life Lenin (left) and Stalin (right) in all their glory. Lenin started the Communist Revolution and Stalin carried it to an extreme of fear. Many busts and statues of others had captions that listed their climb through the party hierarchy until Stalin got upset with them and had them shot. This park was no more expensive than Europas Centras Sculpture Park but was much better maintained and much, much more interesting. One of the buildings had a lot of posters, signs, leaflets, busts, flags and trophies in it. Another was set up as a classroom where the young and old had been indoctrinated with the party line, including an entire library of books and propaganda to support how wonderful everything was in the "worker's paradise". This was a very interesting look into the Soviet mindset and how fearful the leaders were that their people would not support them in their beliefs. Life for the average person was no better, and maybe worse, than it was before the revolution when they were ruled by the Tsars instead of the Communists. As a strange accompaniment to this there was a large children's playground and a mini-zoo with everything from a camel to parakeets, including American turkeys and Vietnamese pigs. From here we go to Poland and visit Hitler's headquarters for his war against the Soviets as well as Warsaw and many other sights. Follow along.